This is a question that many of us in the industry will face at one time or another, and one that can be tricky to summarise in a ten second intro. And for those that do have an inkling as to what PR is, it’s usually for the wrong reasons – with spin doctors and 1984esque propaganda being the two most commonly cited ‘things’ related to the industry. The truth is, public relations, or PR for short, isn’t supposed to be about lies or propaganda, but more about the way that a business communicates with the public, the way it promotes itself or its products, and the way that it builds its image. There are many audiences that can impact an organisation’s reputation. From suppliers and customers, to employees, investors or regulators, they will all form their own opinions on a business and decide whether they want to get behind it or not. That’s where the PR professional comes in, helping to persuade those audiences to do something, such as buy into a product or idea, through telling clear and engaging stories. You may also recognise PR in lobbying, where the overall intention of the communications activity is to inform and influence public policy and law. Perhaps one of the most important sectors that can positively or negative influence opinion is the media – including journalists, bloggers and social influencers, many of whom hold significant power when it comes to informing and persuading. Therefore, PR professionals try to influence them to gain ‘free’ positive publicity, change public opinion, increase brand awareness and amplify key business values. In order to do this, the PR professional has to think like a journalist and devise newsworthy content, eeking out stories a business never knew it had. With most companies across the world heavily investing in marketing and PR, it is clear to see how it is often a tricky task that takes skill, experience and creativity. Many people see PR as simply the writing and ‘selling in’ of press releases to journalists, but this is far from the truth. While crafting an attention grabbing press release is part of the story, PR as a whole entails much more than that, and can include things like stakeholder engagement, stunts, journalist events, sponsorship, writing press kits and copywriting, to name just a few. 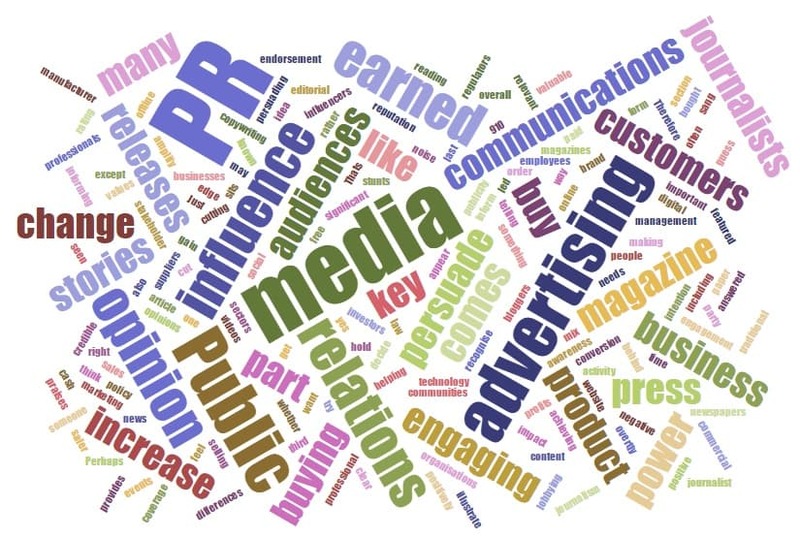 PR is a discipline in its own right that sits under the marketing umbrella, just like advertising. Although the goal of both may be to increase sales or change opinion, there are some key differences in each approach. Public relations does not buy the right to appear in the same way that advertising does and in order to be featured, content needs to be engaging, relevant and not overtly commercial. This is why PR led coverage is known as ‘earned media’ rather than ‘paid media’ (like advertising), and sits in the editorial section of a paper, magazine or website. Earned media is often seen as more valuable because it provides a credible, third party endorsement. To illustrate the power of earned media, can you think about the last time you bought a product after reading an article in a magazine? Did the journalist rating it 9/10 persuade you to part with your cash? And did you feel ‘safer’ buying it because someone other than the manufacturer sang its praises? Our guess is that you answered ‘yes’ to all of the above. With an advert, you get the exact number of pieces you pay for – unless the ad campaign goes viral. But with PR, a story can be approached by journalists in many different ways and give more depth and breadth to whatever it is you’re looking to promote. Obviously there are risks that journalists could say something negative, but it’s the PR person’s job to guide them towards a positive angle. Neither a marketing or PR campaign is cheap, but overall the latter can work out less expensive, often buying you a higher volume of slots that are more credible. In turn, this encourages more businesses and consumers to invest in your offering and increases your bottom line. ‘PR is about working with key influencers and stakeholders to get your business in the spotlight in a positive and meaningful way, in order to increase profits, incite change and communicate key messages’. Are you ready to create your business story? Click here to begin.